We use this for United States Air Force functions all of the time! I am a professional Audio Engineer, I own a recording studio. In the day time I work as a DOD contractor for the USAF. We have used this as a replacement for our CD players for over 5 years. Every time it’s been flawless. We cue ceremonial music, background music, and anything that we need for different ceremonies. I recently showed this to the White House communications staff, when they brought out their Instant Replay for a Mike Pence visit. They were very impressed with the ease of use. We pair these with a focusrite iPad dock to give a professional output for the ipad sound. Nothing but rave reviews for this program. In addition we have saved a lot of tax payer money by using these instead of 2500.00 a piece for an instant replay. iPad+SoundCue+Doc= $600. Big savings. Merges audio channels 😏 My bad! Update- Ipad setting was defaulted to mono. Works great once ipad was set up properly. Thank you Paul! Still hoping to see a L/R fader control in a future update. I was able to load songs into the app, but could get it to do anything else. That was an unfortunate waste of $15. 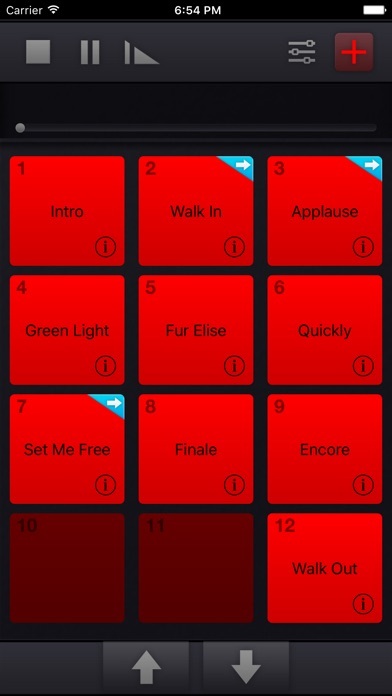 This is a very practical app for running back up and click tracks. It is NOT any good for editing tracks. Your apps have to be ready for use - pre-prepared exactly as you want them. Two short comings; there’s no way to increase font size on the buttons. It’s so small it’s hard to read. Also, it does not auto-change to the next page when the last track on a page has played which is a real pain if the next cue comes real fast. It could also do with a facility to trim down the end of a track as sometimes tracks have a few seconds of audio trail left on them before they finish. This app does exactly what it’s supposed to do. Has never crashed or glitched. As a drummer, it’s great to have my band’s backing tracks at my fingertips on my iPad. A few additions would be awesome: 1). A red “STOP CUE” bar along the bottom of the screen that would stop playback of any track. This would be helpful instead of trying to accurately hit the small stop button at the top of the screen. 2). During playback, when the playing track button is hit a second time have it stop playback instead of automatically restarting it. Furthermore, it may be helpful to put all controls at the bottom of the screen. I am hoping you guys can incorporate these ideas. Thanks! The newest updates make this app perfect for my needs. This app is intended to play tracks not edit tracks, and that is fine because I would prefer to edit tracks in other apps/programs anyway. What this app does is make it very easy to upload audio files from iTunes, Dropbox and more and put them in the order you want them quickly. It allows volume control per track which is a nice touch. A feature that makes this a winner for me is the fade button. Hit fade and the audio file fades perfectly and automatically. This is a big feature for me. One request to the developer - it would be wonderful to be able to drop markers within each track. That way if a track is for a medley, we can mark the start point of each song within the medley and be able to select the marker to start the track at whichever point we want. When it works, it works well. The problem is that when you fill all 5 pages with tracks, it often has trouble loading. I've been stuck on several occasions having to cue my tracks though iTunes instead. Also, it would be helpful to allow for more pages, perhaps in groups so that you don't have to overstress the loading feature? A basic program, good for simple applications. However, it does not support wireless speakers, which rendered it useless for me in a particular theatrical application. Once the app is up and running, it works great. I have all my tracks loaded into the app, and they all work great. However, when launching the app, there appear to be a couple bugs that cause it to crash the first couple times - I think it's related to screen rotation, but unable to verify precisely. 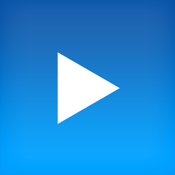 This is a very good app and allows me to get my Magic show in sync with my music and sound cues. The developer is very responsive and friendly. It is a bit expensive, however don't let the price deter you from considering this. A few features which would bring this up to perfect are... Play through bluetooth. Name the page tabs Work with a remote The ability to touch and slides the cues around to different positions would be really nice. It appears that if you want to change the order of cues or add cues in the middle of a set, you have to go through deletes in the cue array and rebuild the array from the last delete. A real pain if you have 40 items and you need to insert near the beginning. Have the "last played" cue highlighted so you can see the next cue in line at a glance. An undo on the clear button would be very helpful.ugh he does have a nice pop up to help I have suggested to the developer on allowing two or more cues to run in parallel and that is being considered i believe. So, buy it, Love it and hopefully new features will be added to make this the perfect sound cue app. Finally! Seems to be working perfectly so far! The only other thing I would add to this is letting you start the song at any point you want. Being able to start the song during the chorus is perfect for my use. I haven't examined this version that closely, so maybe it is possible now… If not, that would be awesome! Your email address was down last time I tried to contact you by the way. I love the app but when the screen goes to sleep or if i turn off the screen - the app locks up and crashes. Only want to get it back is to cycle through the screen again and hit the home button. I think the fadeing should be a little more independent so we can fade 10-20 seconds instead of five. Would that be possible to fix? Other than that it's a great app. I have not updated to the latest version. So this review is for the previous version. It works great and worth the price. It's easy to import custom files. This app was worth every penny and is better than anything else we found available. We used it for a 5th grade public school theater musical production. Very robust, consistent and easy to use. I love this app use it all the time but it was much better when it wound keep track of the songs you had sang will you please bring back this feature. Over all, I like the app. I have had a couple of issues of it crashing, but nothing too bad. I have two big issues. 1. When re-ordering the sounds, I would prefer the q's to not try to re-order themselves while I'm moving a q. 2. I want it to be expandable. I should be able to add more pages of effects. That's my 2 cents. I love this app and use it every Sunday in our worship service. My only recommendation would be a cross fade option from one track to another. I paid good money for this app and it used to work perfectly. 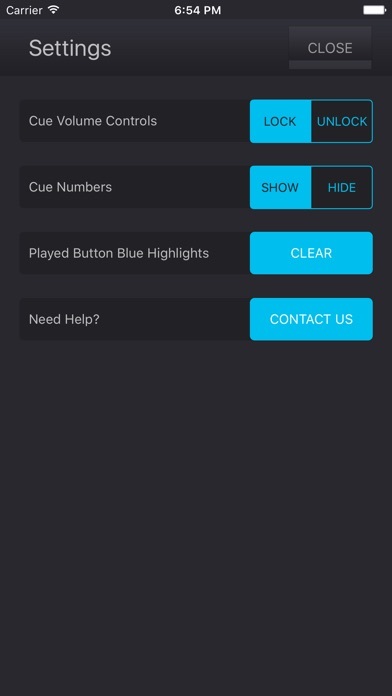 In August it was updated and there have been complaints about the update — particularly the fact that already-played cues are no longer highlighted. Knowing that your customers are unhappy with the update; also knowing that we PAID for this app, why hasn’t this been fixed? Four months later and it’s still “broken”. Support your product and the customers that are paying you! I like the product but would love to be able to save individual Volume levels. It's annoying to open it back up for the next concert and having to reset it all. I am running a musical at my middle school and needed some software to aid in the playback of the backing tracks. I really needed an app that could cut and loop tracks. Nothing in the description said it couldn't do this. At the price point I thought I might as well give it a try. I cannot use this app without the ability to trim and loop my tracks. If your tracks are already set up this is a fine app, albeit very simple and you could do similar things with and iCloud playlist. I do a fair number of theater performances as the “sound guy” and other events where I simply have to either drop a sound effect or an entire song or things like this. This program is far, far less expensive than a professional board for doing this but does the same thing and is far easier to use. Stable, easy to use and does what it says. That’s five stars in my book! It would be Great if you could Trim the in & out points. Other than that it would be 5 stars. I sing about 70 concerts per year. I play all of my tracks from the stage. This app is easy to use and the best one available. The developer is easy to work with and keeps improving the app, but now it's so good there isn't anything left to improve. Have used soundcue for awhile but since the latest iOS update I can't. It will no longer bring the library up just a small piece of the screen shows. Can you help, I paid good money for this app and liked it. It would be perfect if you could adjust the cue points on your tracks and save it. Right now you have to cue a track and then manually slide to the start point you want each time you play it. 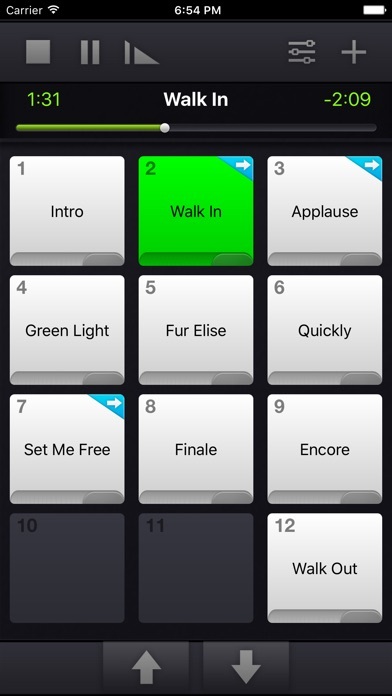 This App is just what the Dr. ordered for live performances! All features are useful and easily understood. I have corresponded with the developer and he is very helpful and open to feature suggestions. I gave the App 4 stars, but if and once there is the ability to have encores it would rate 5!! This would be 4 or 5 stars if the app was reliable. It often crashes on open and it will take two or three times to open. Really nerve racking before an event. Hint: If you use iTunes Match, make sure to download the music first. Previous versions gave me a DRM messages on all our recordings that were in iTunes Match. I love the layout and the ability to set volume for individual songs. The ability to set 125 songs (5 pages x 25 songs) is very helpful. You can also navigate to another page while it's playing. This app is not suitable for live playback. It crashes very often and it will chop up the first second or two of your track if it sits unattended for a little while. Save your money. Buy something more stable. I was researching apps and from what I saw on YouTube this app looked like it would do what I needed. I am a brand trainer and run trainings almost weekly across the state. I needed something to cue music for activities... This is not that app. Yes it will play a song but you have no control over order of cues. If you want to play another song afterwards you have to go in and tell it too but there is no way to control when the song starts or stops and there is no cross fade. Save your money and use iTunes it's free and looks so much better. How can I get my money back? I've already removed the app, it is not worth the space. Sometimes I get nervous before a show because I fear that the app won't open, so when it finally open I'm concern during the whole performance that I will shut down, please fix the bugs because I love this app and I want to be able to trust it. I use sound cue in a performing arts center. We produce many stage plays and other events that call for audio cue playback. This fits the bill. Anyone who has operated a 360, will fall in love with this. Anyone familiar with Replay 360 and don't want to spend the 3k to buy it? Then this is your ticket. Flawless playbacks, easy uploads, easy operation. Thank you developer! I really want to shake your hand, but instead my $15 is joyfully given to you. I play about 160 shows a year with every song having playbacks this has made my life soooooo much easier. Pro quality at a fraction of the cost. Would love to have the option of multiple sound cues to play such as a sound effect during a song. This is the perfect solution for playing live gigs. Much better than the Apple Music app. Highly recommended. Drag and drop is fine if you are always putting your tracks in reverse order and always place them in the first cue position. Otherwise, all the other tracks move and makes placing them in order aggravating! We have to reorder our songs every time we sing at different places, and the difficulty we are having with this program is forcing us to buy another program. I announce football and basketball games for a local high school. Used click effect for years great program. Wanted something more portable to carry and plug in. This app is amazing! Easy to use and imports my songs easily and simple fader! Like some features of the the app but missing features like saving your pages of songs to a file to call up later much like a playlist, instead U have to re assign your songs again and again. Don't see any updates of bugs, has one where the app just shuts off and won't reload, it goes back to the icon. NOT A RELIABLE APP TO BE USING IN A LIVE PERFORMANCE! Overall not worth the money if it is not reliable, but it does function until you shut off your ipad. The one feature this app needs is Bluetooth play out capability. Was told its in the works and an upgrade was coming within the month... about three on this ago! I agree with other suggestions posted here. Cross fade... Rearranging of songs instead of deleting and adding another. Almost but not quite! It's very reliable and easy to use. It makes traveling and performing a breeze (I have it installed on two iPads and an iPhone). This could be the best app ever if it allowed the user to create CUSTOM BUTTON sizes and configurations. THANK YOU!! 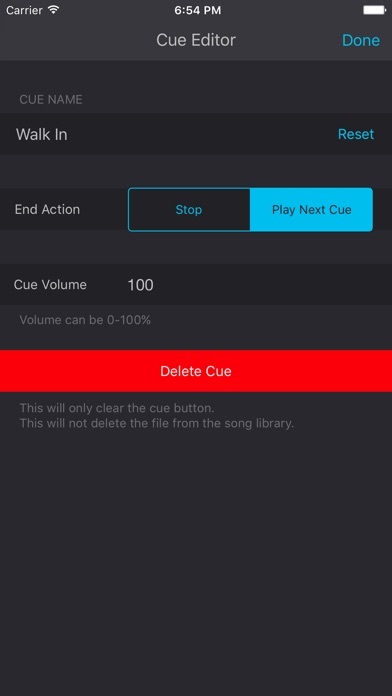 The whole point of having a cue cart app is to let you set up tracks to play at the touch of a button -- at a pre-designated point in the song. Otherwise, you're basically just clicking songs in a playlist. For $15!! this app should do it all. If it were free, I'd give it four stars -- but for $15, it is very disappointing. This thing does not work with Dropbox. Only the iTunes Store.